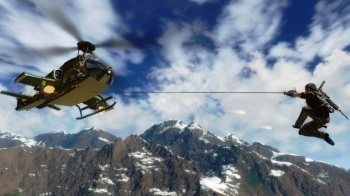 The Avalanche Studio co-founder said that he recommends that publishers not to make a PC game from his console title. Christofer Sundberg is the creative director and co-founder of Avalanche Studio, based in Sweden. Avalanche made the first Just Cause in 2006 for Xbox 360, Xbox, PlayStation 2 and Windows as well as Hunter, a hunting FPS only for the PC. Just Cause 2 came out this week on Xbox 360, PS3 and PC, even though Sundberg said that he doesn't prefer making games for all platforms. Ultimately, the decision is not up to him, but rather rests with publisher Square-Enix. "The choice of developing a PC SKU is always up to the publisher. We can develop anything on any platform as it's just a question of time and money," Sundberg said. "If the game is primarily a console game, we always recommend the publisher to avoid a PC SKU as PC gamers are PC gamers and console gamers are console gamers." Avoiding PC has nothing to do with piracy or anything like that. "Avoiding a platform because of piracy rather than attacking the problem is just giving in," he said, hinting that DRM is needless. "So I'd recommend finding smart solutions to allow players the freedom needed to play our games full out and the developers and publishers getting their return of investment. "All in all, Avalanche Studios is primarily a console developer and the high-end platforms are the ones we prefer," Sundberg stated. Just Cause 2 takes the fun of blowing up stuff in open-world games to a new height, making it a focus rather than a side activity. Sundberg is happy with how it turned out. "The press and consumer feedback has been amazing and we are super proud as we see four years of extremely hard work through a business climate similar to a world-war paying off," he said. I've been playing Just Cause 2 as much as I can but it's a huge world that takes a long time to digest. Look for my review next Tuesday.